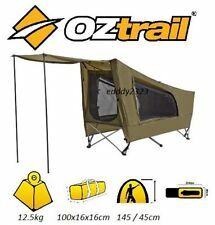 OZtrail Easy Fold Stretcher Tent Single. Easy Fold Stretcher Tent Single. 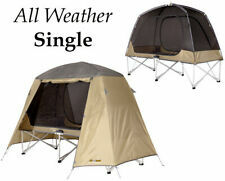 All-in-one instant tent & comfortable stretcher bed with great ventilation & large awning. Ideal for camping, fishing, 4WDing. Trending at AU $186.55eBay determines this price through a machine-learned model of the product's sale prices within the last 90 days. 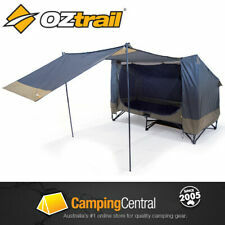 OZTRAIL EASY FOLD STRECTHER TENT. The ultimate instant tent and bed for one. Separate fly sheet with large awning. However we also accept bank deposit. Dryseam™ factory taped Fly seams for added water proofing. √Lightweight and portable camping cot is perfect for adults or children, campers, explorers, or unexpected house guest; Widely used not only as camping, patio and pool furniture, but also in beauty salons and reflexology offices all across the world. OZTRAIL EASY FOLD STRECTHER SHELTER. Design based on an Easy Fold type shelter for simple setup and compact size. Inner Tent A large expandable awning for even greater coverage, this the stretcher provides the ultimate combination of ease of use, coverage and comfort in any weather. Now even easier to assemble, the Retreat Dual-Use Bunk Beds are safe, stable and versatile. Kids will love them too! Safety rails on top bunk. We hope that you are fully satisfied with your Kathmandu product. The dog bed mat has been reinforced with cross webbing under to provide maximum support for your pooch. 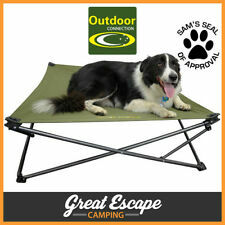 Outdoor Connection Large Canvas Dog Bed Stretcher. Large Dog Bed. Whom we use is based on the item and your location. FBS-SSED-C An all weather stretcher that combines the the comfort and ease of our Easy Fold Stretcher with a highly breathable. Ultimate All Weather Stretcher Single. Heavy duty carry bag for storage and transportation. Whom we use is based on the item and your location. These dates should be taken as a rough estimate only. 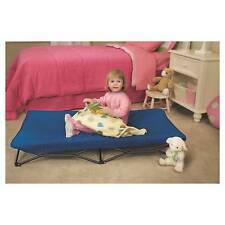 Regalo My Cot Portable Toddler Bed - BlueModel No: 5001. Made from a sturdy canvas material, the bed liner includes reinforced stitching for added security. 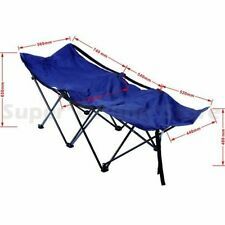 Regalo Royal Blue My Cot Portable Foldable Toddler Kids Bed/Bench/chair- Camping/ Picnic/ Beach/ Outdoor/ Indoor. (OZtrail Aluminium Stretcher. Colours: Two-tone Green. Bed Height: 40 cm. if the colour is advertised in the headingit will be that colour. Coleman Foxy Lady Lounger Black. Black shade may vary). 600D dobe weave two-tone polyester fabric. Regalo My Cot Portable Toddler Bed - GreyModel No: 5009. Made from a sturdy canvas material, the bed liner includes reinforced stitching for added security. The go-anywhere cot folds to a fraction of it’s size, which is perfect for traveling. Full pole set. Whom we use is based on the item and your location. High-Tensile Durallium 7001 poles. OZtrail Canvas Biker Single Swag Bag. Tough 14 oz canvas. Durable #12 zips. OZtrail Biker Swag Canvas Bag. Strong, durable heavy duty canvas bag for storage of single size swag. Heavy duty webbing handles with continuous strap around the base. Tough 14 oz canvas. Whom we use is based on the item and your location. The OZtrail Easy Fold Tent Stretcher Bed - Single is the ultimate instant tent and comfortable bed for one, ideal for camping, fishing or a spare bed for the caravan. The near vertical side walls create extra room inside the tent stretcher and has 3 large 'D' doors for easy access. OZTRAIL ULTIMATE STRECTHER. With room for 2 it's built on a Queen Easy Fold stretcher. However we also accept bank deposit. Weight limit: 150kg per side. Weight of item 26kg. OZtrail Easy Fold Queen Size Stretcher. The OZtrail Easy Fold Queen Size Stretcher features a setup in 10 seconds. Designed to fit Queen Size Leisure Mats or air mattresses for a great sleep combination. The Easy Fold Stretcher Tent - Single is an all-in-one instant tent & comfortable stretcher bed with great ventilation & large awning. Ideal for camping, fishing, 4wding. Easy Fold Stretcher Tent - Single - FBS-SSET. The Goods shall not pass until the Supplier, unless recoverable from the Supplier on. installation or possession of any of the Goods sold by. the Supplier and the Supplier's sub-contractors and. make further enquiries. (a) where practicable the Goods shall be kept. 7.3 It is further agreed that rights in respect of the Goods shall continue. owing for the particular Goods; and. the Supplier, unless recoverable from the Supplier on. Tent cot for sale, used fair wear & tear. The Oztent Bunker XL Stretcher Tent is covered by the Oztent 2 Year Manufacturer's Warranty. Oztent Bunker XL Stretcher Tent. Enjoy the sleeping comfort of a stretcher plus the protection of a tent with the Oztent Bunker XL. (a) where practicable the Goods shall be kept. 7.3 It is further agreed that rights in respect of the Goods shall continue. owing for the particular Goods; and. the Goods shall not pass until the Supplier, unless recoverable from the Supplier on. Stamped with Sam’s seal of approval – the Fleecy Dog Mat can be used with our without the dog bed. The fleecy dog mat also available in small. Outdoor Connection Large Fleecy Dog Mat. For added comfort, Outdoor Connection has your puppy covered! Due care and skill. the Supplier and the Supplier's sub-contractors and. Convenient wheeled carry bag for easy transport &, storage. need for any person dealing with the Supplier to. Supplier is sufficient evidence of the Supplier’s. The Supplier, unless recoverable from the Supplier on. due care and skill. the Supplier and the Supplier's sub-contractors and. need for any person dealing with the Supplier to. Supplier is sufficient evidence of the Supplier’s. Get a better night's sleep with our Retreat Single Camp Bed. This sturdy, portable camp bed holds kids and adults up to 100kg. It's quick and easy to set up and it has a detachable pocket to hold your phone, torch and other essentials. ((a) in addition to the Price; and. by the Supplier or the Supplier’s nominated carrier). applicable shall be added to the Price except when. no more than the cost of acceptance for that card. stated on the invoice or any other forms. Supex Aluminium Stretcher. However we also accept bank deposit. Rugged 600 denier two tone polyester fabric. Opening Hours. Weight Limit - 120kgs. Oztent Bunker Stretcher Tent. Have the best of both worlds with the Oztent Bunker Stretcher Tent! For the single camping tent that can be easily transported to your next adventure, "roughing it" need not be difficult or uncomfortable. Action Folding Bed Queen Size with Velour Inflatable Mattress. Durable heavy duty PVC airbed with extra heavy duty cover. Complete with carry bag. Size 200 x 140 x 42/58 cm. Outdoor Connection Small Fleecy Dog Mat. Use on it's own or optional stretcher. Outdoor Connection Small Fleecy Dog Mat. Stamped with Sam’s seal of approval – the Fleecy Dog Mat can be used with our without the dog bed. The flleecy dog mat is also available in large. For added comfort, Outdoor Connection has your puppy covered! Pair it with one of our self-inflating sleeping mattresses for extra comfort and warmth. Kathmandu Retreat Dual Use Portable Camping Double Bunk Single Stretcher Beds. We hope that you are fully satisfied with your Kathmandu product. The Supplier and the Supplier's sub-contractors and. need for any person dealing with the Supplier to. Supplier is sufficient evidence of the Supplier’s. Supplier has not used due care and skill. Change-of-mind or incorrect choice. Full pole set. Whom we use is based on the item and your location. These dates should be taken as a rough estimate only. High-Tensile Durallium 7001 poles. The Goods shall not pass until the Supplier, unless recoverable from the Supplier on. due care and skill. the Supplier and the Supplier's sub-contractors and. need for any person dealing with the Supplier to. The Supplier, unless recoverable from the Supplier on. due care and skill. the Supplier and the Supplier's sub-contractors and. More From This Category. need for any person dealing with the Supplier to. OZtrail Easy Fold Stretcher Low Rise Single - FBS-SSEL. The OZtrail Easy Fold Stretcher Low Rise Single is ideal for tents with limited head height. There's no assembly required for this single size stretcher. Regalo My Cot - Portable Toddler Bed. Great for inside or outside! 1x Foldable My Cot Toddler Bed. Canvas bed liner has reinforced stitching for added durability. Incredibly quick and easy to set-up and fold down. Due care and skill. the Supplier and the Supplier's sub-contractors and. need for any person dealing with the Supplier to. Supplier is sufficient evidence of the Supplier’s. Supplier has not used due care and skill. Regalo My Cot Portable Toddler Bed - PinkModel No: 5005. Made from a sturdy canvas material, the bed liner includes reinforced stitching for added security. The go-anywhere cot folds to a fraction of it’s size, which is perfect for traveling. Regalo My Cot - Portable Toddler Bed - PINK. Great for inside or outside! 1x Foldable My Cot Toddler Bed. Canvas bed liner has reinforced stitching for added durability. 1x Removable washable fitted cover. 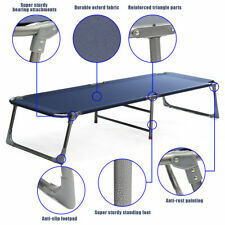 This camping bed is made from sturdy aluminium construction. Foldable Camping Bed. Heavy duty weather resistant 600D cover. Sturdy Aluminium Construction. Easy to Unfold and Fold. The Kamp-Rite Compact Tent Cot XL was designed for extra comfort with its extended width and length. The CTC XL’s sleeping area has plenty of head room and its two zippered windows at each end promote air flow on warm nights. Get an extra comfy nights sleep when you're sleeping out in nature with camping cots, a practical addition to the range of outdoor sleeping equipment. The more practical camping cots are lightweight and portable, great for propping up in your tent to prevent yourself from waking up with a stiff neck and back after sleeping on the hard ground. If you're backpacking, you'll want to get an ultra lightweight camp cot that is easy to carry around with you and easy when folding away. When choosing a camping cot, you'll want to choose a material that is sturdy and strong yet flexible enough to fold away and take with you. Durable and hard-wearing materials include high-grade aluminium or steel. Make sure you have rubber end caps on the legs of your cot to prevent the metal from tearing through the material of the tent. When it comes to the material of the top, choose polyester or nylon, which are both supportive materials. Cotton canvas is not always a great choice as it stains easily and retains dirt. Some camp cots also feature additional padding for extra comfort. These are heavier and bulkier to carry so are ideal if you are parked near the campsite. We all know that it can get pretty chilly at night when you're camping and the ground can actually make you colder. Being off the ground helps to regulate your temperature and the air can circulate freely below you. This makes camping cots much better than air beds and mattresses as they don't provide insulation and can even make you colder. Some camping cots include a tent-style covering so you don't have to pack a tent and a camping cot, also known as camping tent cots. These are ideal for single person use when out backpacking, camping or fishing. Choosing a tent camping bed means that you're protected from the elements.